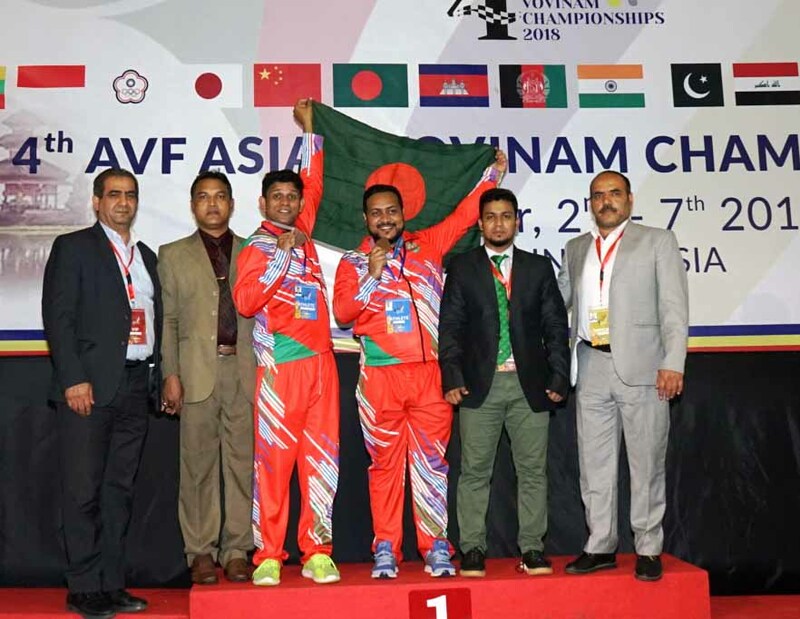 Ariful Islam, Abu Masud Chowdhury (center) of Bangladesh, who earned one bronze medal each in the Asian Vovinam Championship and the officials of Bangladesh Vovinam team pose for a photo session at Bali in Indonesia recently. Bangladesh earned two bronze medals in the Asian Vovinam Championship held at Bali in Indonesia recently. Ariful Islam of Bangladesh bagged bronze in -82 kg weight category, while his compatriot Abu Masud Chowdhury collected bronze in -77 kg weight category. A total of 16 teams took part in the sports meet. They are: Vietnam, Cambodia, India, Afghanistan, Myanmar, Indonesia, Thailand, Philippines, Laos, Pakistan, Hong Kong, Bangladesh, Iran, Iraq, Taiwan and Japan.